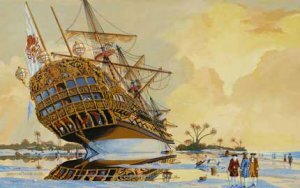 James A Flood original marine art paintings portray sailing vessels, ocean liners, tall ships and 20th century ships of war. 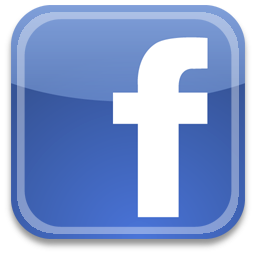 Many of our pages contain points of interest and links leading to additional information. For those intersted in nautical decor, art prints are available for purchase as lithographs, canvas or art paper reproductions. Original paintings are available when specified. Please see the selection of his work in Original Paintings and Prints. 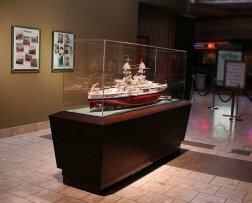 View James A Flood's scratch built ship models Here. Included are step-by-step photos. 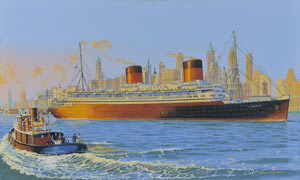 In this painting, SS Liberté is portrayed slowly pulling past the skyline of New York in the mid 1950s. She has slowed down slightly to enable the tug in the foreground, which is turning in towards her, to drop off some late arrivals for the voyage to France. Among the passengers are two stars from the movie Sabrina, Humphrey Bogart and Audrey Hepburn, best known as Bogie and Sabrina. Many movie scenes were made that involved SS Liberté, perhaps the best known being the 1954 movie Sabrina. The beautiful liner makes her appearance in several scenes but is best known as the romantic backdrop for the well-known deck scene with Audrey Hepburn as Sabrina Fairchild and Humphrey Bogart as Linus Larrabee. In this painting Sabrina and Linus are observed in a fiction-into-fiction anniversary celebration, where they ceremoniously ride the family tug, now named the Sabrina Larrabee, to board SS Liberté for yet another voyage to France. 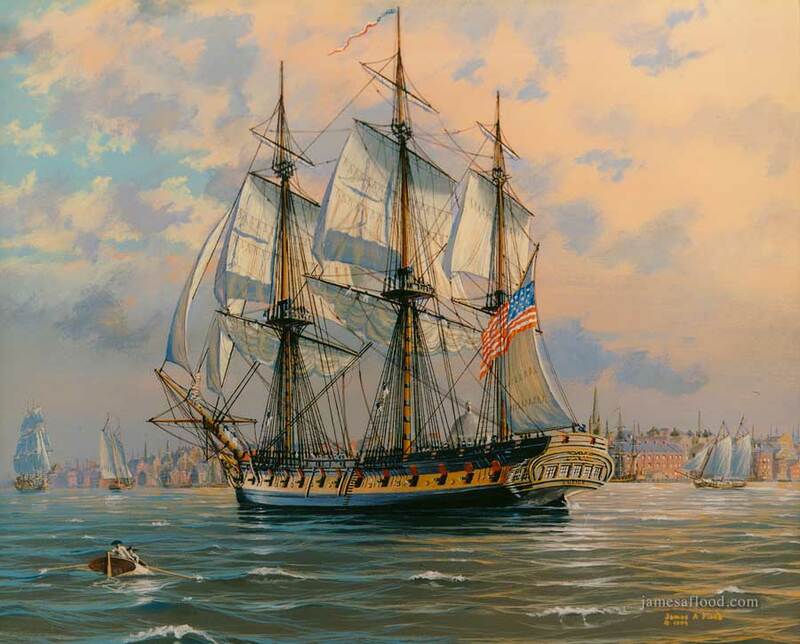 In this painting the second frigate Boston is depicted departing Boston Harbor, Massachucetts in 1804. The topsails have been set and the crew is in the process of loosing the courses. It's a windy day, so the topgallants are still snugly furled. The outer or flying jib is set; the jib is furled; the forestaysail is set. The wind is off her starboard quarter. 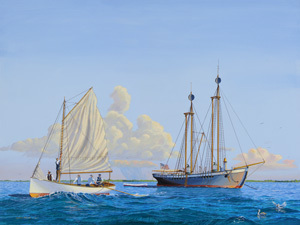 “Going for Wood” the Carysfort Reef Lightship Florida, a painting by James Flood, is the cover art for an upcoming book by author Neil Hurley. 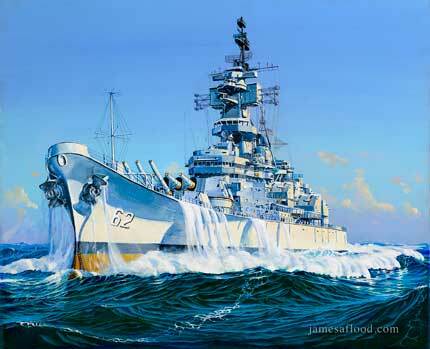 This painting depicts USS New Jersey at sea in rough weather, heading for the gun line off the coast of Vietnam. 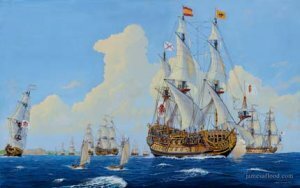 Above the Spanish Treasure Fleet is depicted sailing out of Havana Harbor in late July. Above depicts the former Hampton Court beached off the Coast of South Florida, officials having arrived from Havana to oversee salvage.